The way I currently plan and create blog content isn’t exactly profound, but it’s a system that seems to work great for me and I wanted to share that with you today. I think it’s important to have a process, or a system, for anything you do on a regular basis in order to streamline it and save time. 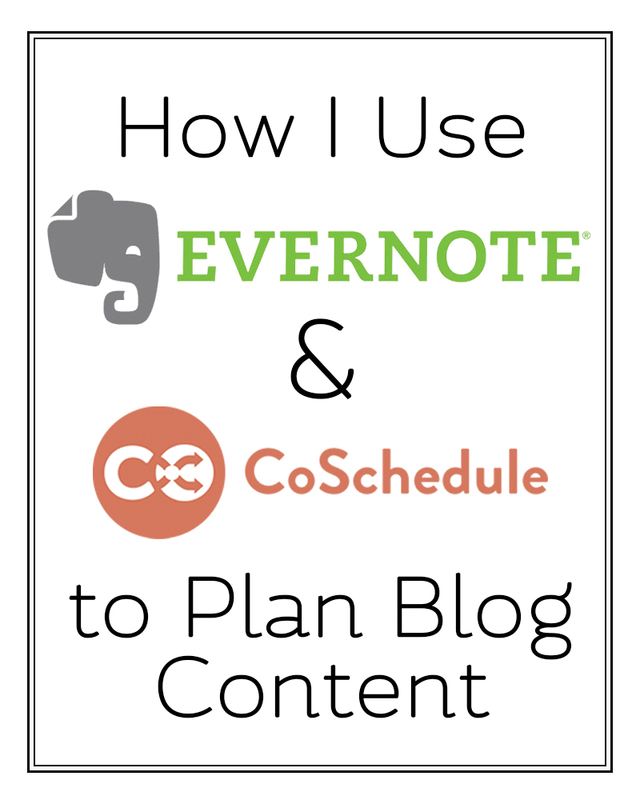 After reading my post back, the following can be a little confusing if you’re not familiar with Evernote or CoSchedule, but once you create the system it really makes everything much easier. Evernote: Sign up for one month free trial of Premium. Once the trial is over you can continue with the free/basic plan which is what I currently use. The first step to planning blog content is brainstorming. First off, I have a notebook in Evernote called “AileenBarker.com Posts”. When I’m brainstorming posts, or simply get inspiration for a post, I create a new note for each post with what the post will be about or a tentative title. This is great because not only do I have a running list of ideas, but I also already have an easy space to create your drafts for your posts. I will even go in and add little notes, reminders or links when I come across them so that they’re all in the same spot when it comes time to prepare that post. Before I talk about getting my tentative editorial calendar set up, I want to walk you through setting up Evernote so that it’s easily viewed. 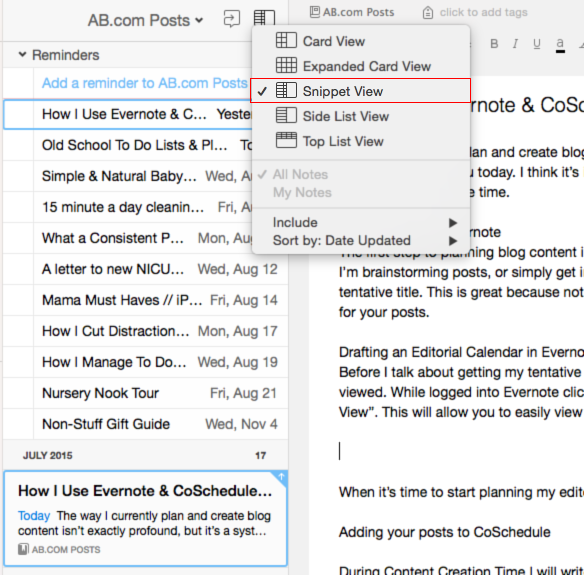 While logged into Evernote click on the notebook you want to use and follow the steps below to set your posts to “Snippet View”. 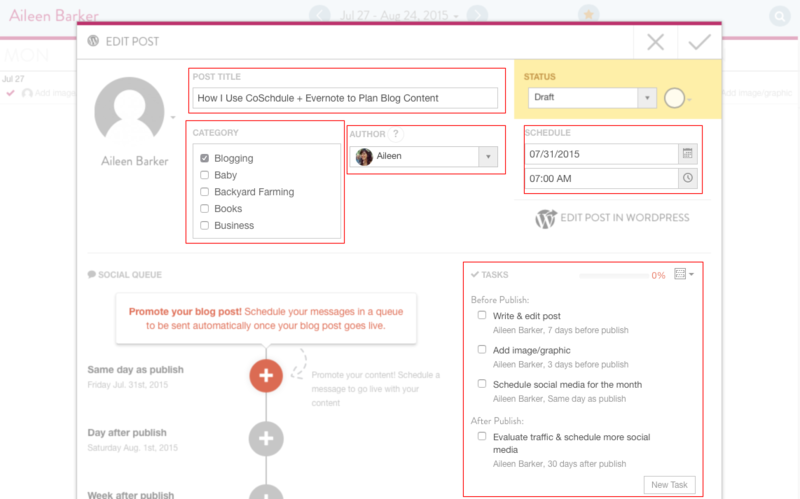 This will allow you to easily view your posts based on their due date (aka publish date). Once you have “Snippet View” activated as shown above, you can add a reminder to your posts for the date you want the post scheduled. To do this select the note with the post you want to schedule and click the clock in the top right and select a date. 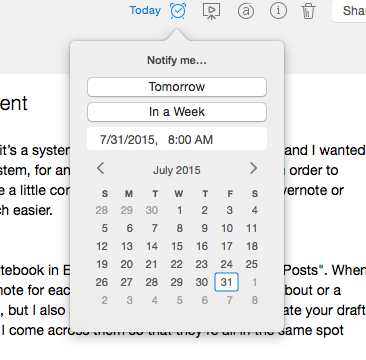 Once you have a few of your notes with reminders set it’s time to set up your post list to show reminders. Following the images below enable the “Sort Reminders by Date” and the “Show Upcoming Reminders” settings. Now you should have a tentative editorial calendar for your blog! You can certainly have your editorial calendar set up in CoSchedule (which I do too! ), but this helps me know which post is next and jump from post to post easily. Once I’ve finished the post and scheduled it I check off the reminder and then move the note to my “AileenBarker.com Posted” notebook so they’re archived and out of the way. 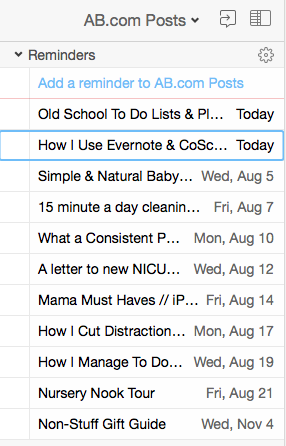 Although I have a version of an editorial calendar set up in Evernote, that’s really just to help me know which posts I need to work on at a glance. Once I have some posts that need to be scheduled I go into CoSchedule through the WordPress Dashboard and add each post there. When I add posts to CoSchedule I just add the basics like the title, author, category, scheduled date/time and then I add a task template (see next section). That’s all I really need to do so that I have it set up to copy and paste the post from my draft in Evernote. This is totally optional, but it really helps me keep things organized and assure that I’ve covered all my bases for each post. All of these tasks will show up on my CoSchedule Calendar so that I can make sure everything gets done in time and, my favorite, I can remember to visit that post again in a month to see how it did and schedule more social media sharing if needed. To create a task template select the little drop down next to “Tasks” on the post pop up and click “Create New Template”. 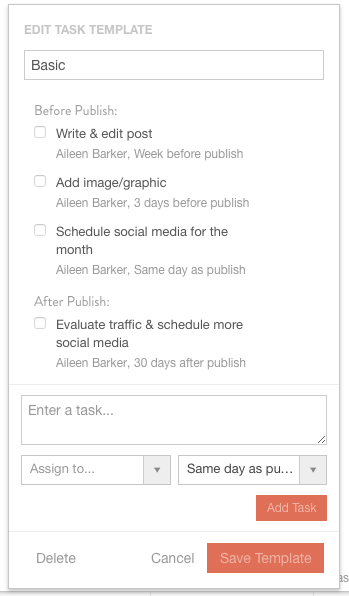 From there you can add new tasks as well as when you’d like them to be due. By this point you should have a post draft in Evernote and an empty draft with all the settings set up in CoSchedule. The only steps left are to just copy and paste the post into your Wordpres post and finish it up. I’ve been processing my posts this way for about a month now and it really has helped me streamline it so I’m not jumping around and wondering what I should do next all the time. Let me know if you have a system in place for blogging, I’d love to hear it! Disclaimer: This post contains referral links which might give me compensation or a discount on the featured services. All opinions are my own and I truly do love both Evernote and CoSchedule. This was really helpful. I’m just now deciding if I want to invest in CoSchedule and am doing the trial. Your post was great as it was very practical and explained how you have set up your process. I appreciate you explaining that! You’re welcome!! Thanks for shopping by and taking the time to read the post.